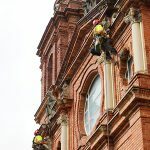 Vertical Access assisted Joseph Oppermann, AIA with a conditions survey of the interior and exterior of the Basilica of Saint Lawrence in Asheville, North Carolina. The Basilica of Saint Lawrence has been listed on the National Register of Historic Places since 1978. 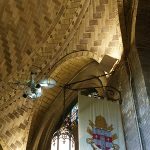 The church was designed and built in 1905 by Spanish architect Rafael Guastavino Moreno along with his fellow architect R. S. Smith and the Roman Catholic community of Asheville. Pope John Paul II elevated the status of the church to minor basilica in 1993. The only basilica in western North Carolina, the dome of the Basilica of Saint Lawrence has a span of 58 by 82 feet and is reputed to be the largest freestanding, elliptical dome in North America. Except for the foundation and brick walls, the construction method is traditional Catalan, with notable examples being the dome and stairs. It is located in the Downtown Asheville Historic District. Rafael Guastavino Moreno (1842-1908), an architect and builder of Spanish origin, emigrated to the United States from Barcelona with his son, Rafael Guastavino Esposito in 1881. Guastavino Moreno came to Asheville, North Carolina to work on the Biltmore House in the mid-1880s. Liking the area, he bought land and built a house in nearby Black Mountain. In 1905 his design of the present church went into construction and was completed in 1909. The Basilica of Saint Lawrence was R. Guastavino Moreno’s last project, and he is entombed in the front chapel. His son, R. Guastavino Esposito continued to operate the company until the 1960’s. The basilica is known for its many elaborate stained glass windows, many of which were made in Munich, Germany. Conducted an inspection of the exterior façades using high-resolution video documentation from an Unmanned Aerial Vehicle (UAV or drone). Conditions observed in the UAV video were annotated on the drawings using TPAS, with notes linked to still images taken from the video. Investigated the exterior central bay between the two towers of the principal façade using industrial rope access. Interior Guastavino tile, terra cotta and brick components were inspected primarily at close range or with the aid of binoculars. 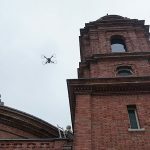 Upper areas of the sanctuary walls, including the stained glass windows, were inspected by UAV. Evaluated the extent and pattern of moisture within the wall materials using an FLIR E60 infrared (IR) camera. Joseph K. Oppermann, Architect, P.A.